I keep trying to get the Start menu on Windows 10 to show what I want and not what Microsoft wants. I turned off the first two entries in Personalization, Start. I especially do NOT want app or content suggestions in my Start menu. I suppose this is yet another bug. But it is most annoying that I can’t get the Start menu to look anything like the Start menu in Windows 8.1 on my tablet. And I LIKE the Start menu on tablets in 8.1. The Windows 10 Start menu was built for Phones and for folks that use Portrait View. 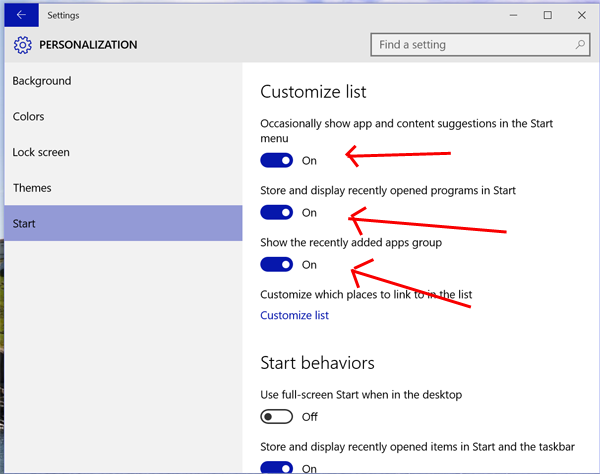 If you find that you can no longer get the Start menu to display in 10130, you’ll have to not opt out of what Microsoft wants. At least for now.